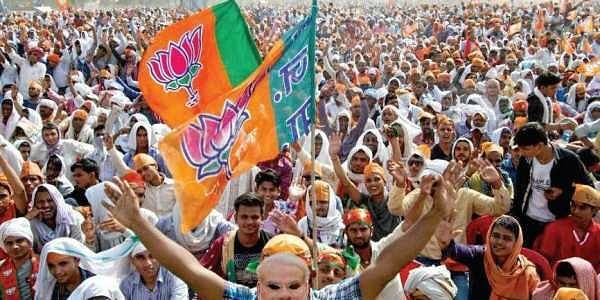 The BJP is carpet-bombing the Kangra valley with rallies by top leaders, in an indication that it could again play a key role in deciding the winner of the November 9 Himachal Pradesh elections. NAGROTA: The BJP is carpet-bombing the Kangra valley with rallies by top leaders, in an indication that it could again play a key role in deciding the winner of the November 9 Himachal Pradesh elections. In 2012, the lotus had wilted in the valley when the Virbhadra Singh-led Congress swept 10 of its 15 seats, denying Prem Kumar Dhumal the chance for a saffron rerun. “The Prime Minister kicked off his campaign with a rally in Kangra valley. BJP leaders are swarming the place in an unprecedented manner,” said Sudesh Chouhan, a government employee. BJP chief Amit Shah is learnt to have taken upon himself the task of ensuring that his party does not run into the ghost of 2012, when it could win just three seats in the district. “In 2012, Dhumal and the Lok Sabha MP from here, Shanta Kumar, had sparred to defend their respective political turfs, which proved detrimental to the party’s interests. Shah is giving due recognition to Kumar in this election, while Dhumal is promising to bring development work to this district on the lines of Hamirpur,” said a local BJP functionary. However, Kangra, the most populous district of the hilly state, is humming with complaints against the Modi government at the Centre. “Only a couple of days back, the price of an LPG cylinder was hiked by Rs 96. Besides, onion prices are burning holes in the kitchen budget,” said Sumitra Rana, a beautician in Nagrota town. The people were unable to spell out specific grievances against the goods and services tax but claimed there was a loud negative buzz about it. In 2007, Kangra had thrown up an opposite verdict, with the BJP winning 10 of 15 seats. “Panch-panch saal (five years each),” said Rajesh Thakur of Dehra constituency, suggesting that people in the district liked a change in the party in power every five years. He added that Congress candidates were well known to the people. Although the Thakurs are the predominant caste accounting for roughly 30 per cent of the electorate, too many candidates from the community are threatening to split caste votes. “Brahmins have been traditional BJP supporters. With two Thakurs (Virbhadra and Dhumal) slugging it out for the chief minister’s chair, the caste vote will split. In many seats in Kangra, both parties have fielded Thakur candidates. This gives an advantage to the BJP, which hopes to gain sizeable Brahmin votes,” said a BJP functionary. Himachal Pradesh has 68 Assembly constituencies with an electorate of 49,91,921. Kangra, which is dotted with temples, has an electorate of 11,83,468 and draws hordes of religious tourists. Foreign tourists throng Dharamshala and Mcleodgunj, mostly to seek an audience with the Dalai Lama.